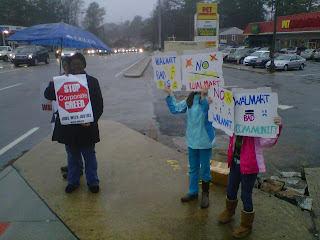 This past Friday over 40 Decatur, GA community residents came out in the pouring rain to tell the world they value strong communities, good jobs, safe roads and local businesses. Decatur community members stood at the six road intersection near suburban plaza with signs and good spirits. 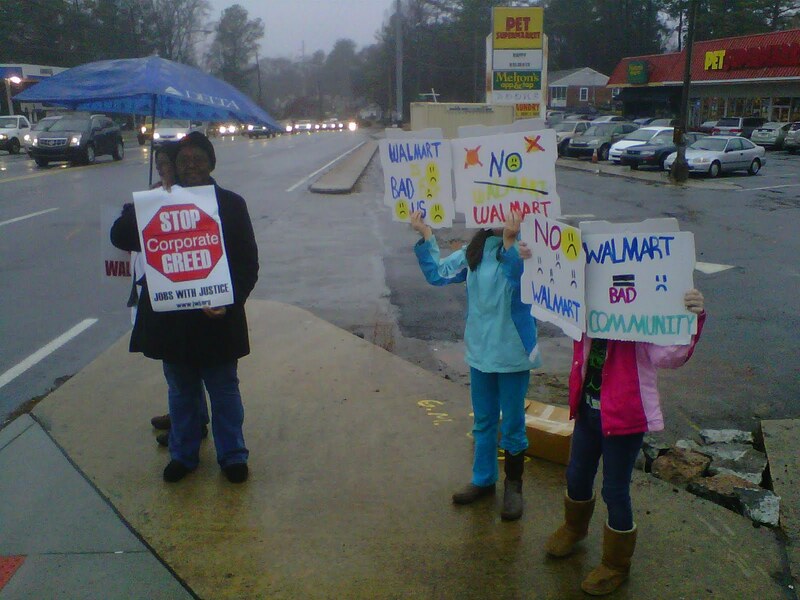 Community members are quickly mobilizing to develop a strategy to keep out the poverty spawning behemoth: Walmart. The Decatur community and allies will be out again this Friday January 27th, 4:30-5:30 pm at the intersection of N. Decatur and Scott Boulevard in Decatur, GA. Come join ! 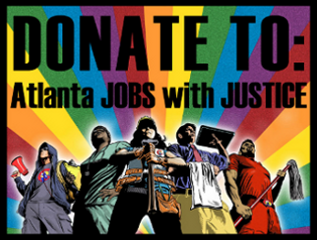 Atlanta Jobs with Justice stands with the Decatur Community! Atlanta Jobs with Justice sang and marched side by side with our sisters and brothers from the community and the Atlanta labor movement on MLK day. We marched from downtown Atlanta to Ebenezer Baptist Church. It was an opportunity to remember the legacy of MLK and to continue that legacy by raising awareness within our community about the 740 layoffs that are facing CWA union members at AT&T. It was MLK that fostered relationships between labor unions, community members and anyone that supports dignity. It was in this spirit that we mobilized on MLK day and it is in this spirit that we will mobilize on February 14th to keep our community working with dignity. A poem by Martin Espada. then this is the year. fill with the angels of bread.